If you go and ask 10 experienced programmers about what is their biggest professional fear, 7 would say to become obsolete. I don’t have any hard data to support such a statement, it was pure empirical, literally I went and asked this to 9 of my colleagues and got these answers. Some more serious people concluded than one in three developers fear A.I will replace them, but that’s another discussion. So here I am, 10 years old ABAP developer trying to catch up with SAP’s latest technology. I’m starting this blog as kind of a journal in which I could come back to it one year later, and let 1-year future me decide whether there have been any improvements, or it was just a waste of time -although no time in educating yourself is wasted time, I believe. Hopefully we won’t get to this point anytime soon. To improve in OOP, I decided to take some examples out of the book Head First Object-Oriented Analysis and design, which is also very good and fun to read. The first chapter describes a guitar store owner who decided to ditch his paper-based system for keeping tracks of guitars and start using a computer system to manage his inventory. Naturally, he bought SAP ERP and hired a consultant to implement his system. Ok, that was a bit disappointing, but still a good place to start. Each of the guitars are represented by the abstraction ZCL_GUITAR, which has the same structure as the database table ZGUITARS. Nothing much to see in ZCL_GUITAR, as it represents just a data structure, there’s no behavior inside. Instead of creating setters and getters methods, thought it would be a good idea just to create a public attribute and make it read-only. class zcl_guitar definition public final create public . data: guitar_record type zguitars read-only. 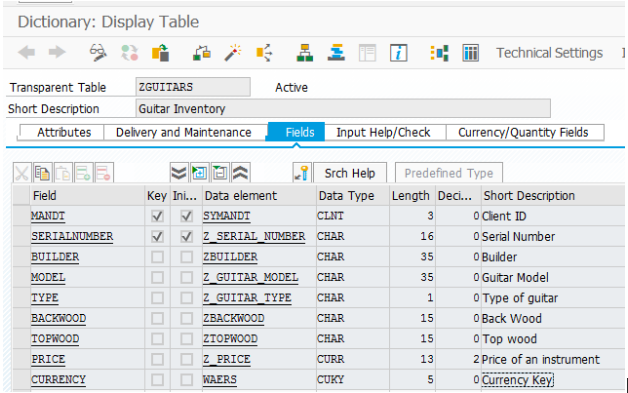 methods constructor importing i_guitar_record type zguitars. add_guitar_test for testing raising cx_static_check. data inventory type ref to zcl_inventory. inventory = new zcl_inventory( ). 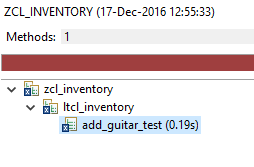 inventory->add_guitar( new zcl_guitar( guitar_record ) ). cl_abap_unit_assert=>assert_subrc( exp = 0 act = sy-subrc ). One pretty cool thing about hashed tables is that they throw exceptions when you try to insert a duplicate record. The annoying thing is that this feature apparently only works for the secondary key. This left me no other choice than checking for SY-SUBRC in the test method. insert guitar_record into table me->guitars. Run the test again and great! First test passed. But what about when you are provoking an exception and this one does not get raised? The recommended solution in the previous link did not work for me. Even after the second call to the method under test, the exception did not stop the execution of the test method and I got the wrong error that an exception was not raised. After removing the cl_abap_unit_assert=>fail call the test passed, though. duplicate_guitar for testing raising zcx_guitar. data(guitar1) = new zcl_guitar( guitar_record ). data(guitar2) = new zcl_guitar( guitar_record ). Well that’s gonna be it for this time, next time I’ll come up with more tests to make and will try to improve the design of this simple application. Wherever I’ve worked, I’ve worked to make myself obsolete. That way I can go and do something more interesting. Exactly. Like that internet mem of a cat reading a newspaper. I’ve seen some our your excellent posts/answers etc. on here. If you are at risk of going obsolete then I think there’s not much hope for the rest of us! Man, remember the dialogue by Arnold Schwarzenegger in Terminator 5? 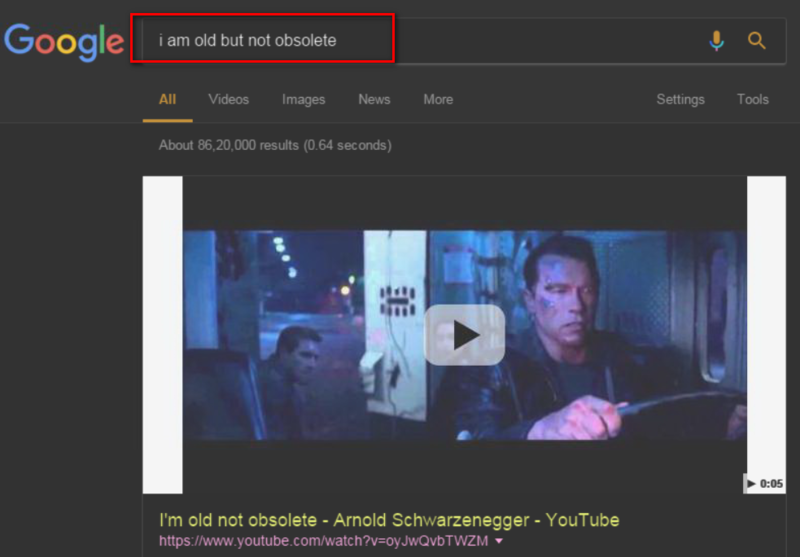 “I am old but I am NOT OBSOLETE”. I wish I will be qualified to say this sentence when I am 50 years old. I learn hard every night after I left office just in order not to be obsolete. Due to the large population, there are a tremendous number of excellent programmers in China. See this report from HackerRank finds that while the U.S. and India have lots of developers, Chinese and Russian programmers are the most talented. Working under such circumstance I have to keep learning, otherwise be obsolete. That’s life. That “Head First Design Patterns” is a great way to move yourself forward. Somewhere on the SCN you will see a blog I did some years back where I was redoing the “Gumball Machine” chapter from that book in ABAP. A lot of programmers don’t care about becoming obsolete they just keep doing what they have been doing the last ten years, because it still works. I wrote an SAP Press book all about the various new technologies and all my colleagues at work got free copies. A lot of them found it really useful, one guy felt his desk telephone was too low so used my book as a stand to make it a bit higher, and another guy had a desk where one leg was shorter than the other three so my book came in really handy there as well. Funny because I’m using your book as a guide to catch up with NW 7.50 and make myself proficient in recent technologies. And you’re right, between staying in the comfort zone and fear for change, many people decide just to stay where they are. Specially when there are no incentives to move forward: Stable job, doing programming merely as a job (people who actually do this as a hobby as well tend to be more up to date), and so on. Being a freelancer also forces you to sharpen those skills for what the market is demanding. Not updating yourself is, as I have read from you somehwere else, committing professional suicide. I bought your book. So far, I’ve taken the shrink wrap off. While I agree with you, that learning something new is always a good idea, I don’t fear being replaced by AI or something. I think we as a society should re-think the dogmatic connection between (financially) securing one’s livelihood and working. Concepts like the basic income are right there, they “just” need to be implemented. I’m still fascinated that while this blog has gotten so much attention back then, this comment, providing a different view on the the inital question ((when) is becomming obsolete a bad thing?) got no reacation at all. Am I really that far off, that alone with my view here? We recently notified SAP of a badly performing bit of code. They sent back some new code that does improve performance. What was depressing, however, is that instead of using 15 year old technology and using HASHED/SORTED tables, it uses a standard table, sort and binary search (30 year old technology?). The program that was developed for us by the consultants just a couple of months ago starts with TABLES. The sad thing is they are likely not the ones who will become obsolete simply because they rates are 1/5 of the US rates and that’s all that management cares about. In China we call these guys ( normally with low pay ) “Coder” (kindly don’t mix it with the same word used in “TopCoder” ). Coders are not programmers or developers. They simply finish coding according to the software specification. How about program design and code quality? They don’t care at all. Excellent blog! Thanks a lot for your nice conclusion on the topic listed in your blog. Being an employee working in SAP, I just have some comments here. I saw the word “SAP’s latest technology” within the communication of this blog above, no doubt that it could be quite good for an ABAPer to keep learning them as you listed, and IMHO it could be even better if an ABAPer has some basic awareness of the latest technique trends in open source community. Perhaps it is difficult for a traditional ABAPer to touch some of these trends in daily work, however I do think that by knowing them, it can help you to become a better programmer, not just a better ABAPer. In order to avoid that my comment become so lengthy here, I post the detail reason why I think it is worth putting some effort on these four points into another blog: What should an ABAPer continue to learn as an application developer Hope you don’t mind. Last but not least, there is a technical discussion session about ABAP OO Design held by our team Architect next week. Our Architect recommend every colleague to read your blog first before the session, which proves you did really a good job! See the meeting request where your blog is mentioned below 🙂 Thanks a lot for your blog again. Wow, I certainly never expected this, definitely will go to read your post right away! I Loved this blog and the answers. I was asked the other day by my boss – how many times were you able to just pick up a specification and use it to write your code. Then go back and have your code work. My answer was never. I needed to know what happened before, after, and then I could put something together. 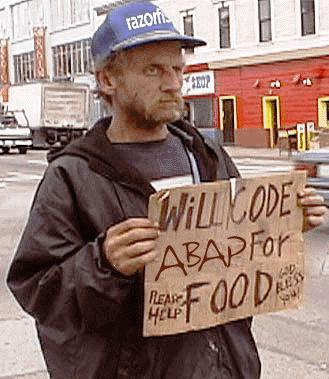 HOWEVER, not so long ago I could have held the sign ABAP for Food. My job was outsourced to a different country. Bummer, right? But what made me valuable and not obsolete was my strong development skills – yes. BUT I knew a little about various other things. Functional areas, security, BASIS… Now I have a job I love! BTW – 20ish years in SAP… I’ll always be learning. That’s the fun part of it. A couple of people have touched on the situation I’m experiencing which is not an issue of obsolescence but rather commoditization. Simply put, our skills are becoming less valuable. It doesn’t matter if you are the best ABAP developer in the world if it’s only worth $30 per hour. If visa laws continue to be abused and offshore capabilities continue to improve, then these skills are less relevant (at least in the US). How is it in the EU? For those of us who survive it’s an ongoing battle. In the past you might have had a team of 5 or 6 developers where you would share information and bounce ideas off of each other. Now you have a blended team with 1 or 2 onsite and 5+ offsite. The richer development tasks go offsite and onsite deal with break fixes and requirement gathering,etc. On a few occasions I’ve considered switching away from SAP. Even though my comments are somewhat bleak I am an optimist and do try to grow my skills. I am very fortunate to be on a HANA project currently where I am able to do some development. We always need to find ways to demonstrate value…to fill a niche. Just found your blog and would like to thank you for your time and effort. I agree with everything that is said here. This Saturday I have attended to my first ABAP Code Retreat and I would suggest to anyone who wants to move forward. 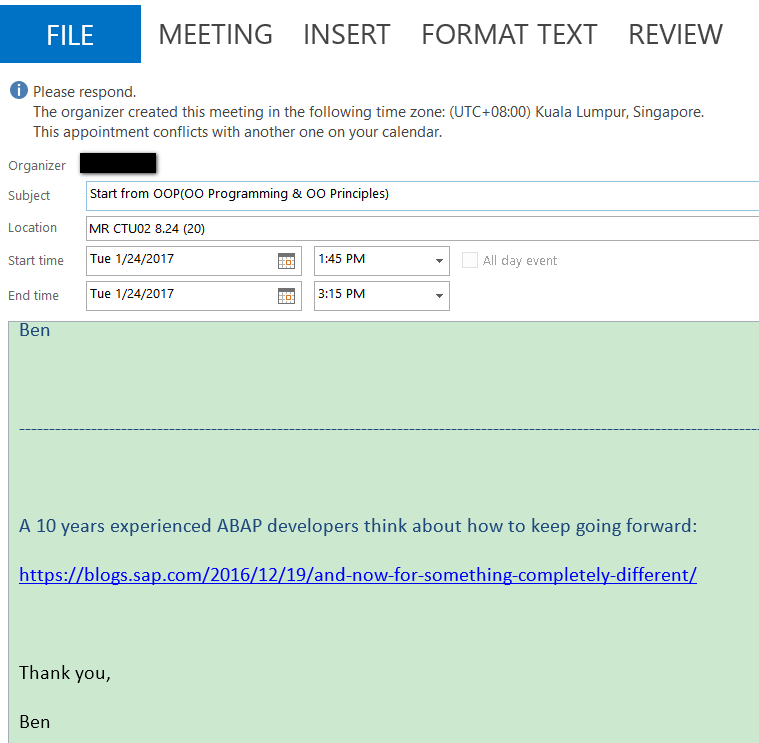 The content is about TDD and you use Eclipse but the best thing is to find people working in ABAP that want to continuously evolve. I definitely recommend that you attend an ACR next to you. And just for constatation, my trigger to learn more was after reading Paul Hardy book. It was a real motivation for me. After that one, I went to HFDP and then you get addicted to learn….and feel that the more you learn…the more you need to learn!